We have 3 European TestBash events happening in the first half of 2018 and we are looking at you, yes you, to come and be brave to join us on a TestBash stage. We currently operate a continuous call for papers. This means you can submit a talk at any time and we will consider it for our upcoming events. However, there are cut off dates – decisions need to be made and great events needed to be planned for! Our TestBash events are super special! We put a great emphasis on supporting everyone who speaks and attends. It is diverse. Engaging. Inclusive and full of learning opportunities. No Pay To Speak: we believe financial barriers shouldn’t stop you from speaking at a conference. If you are accepted to speak we will cover your travel costs, no matter how near or far you come from. Scholarship fund: we operate a scholarship fund where all sorts of people from the community contribute so we can give free access to our events. We believe in making attending as accessible as possible too. 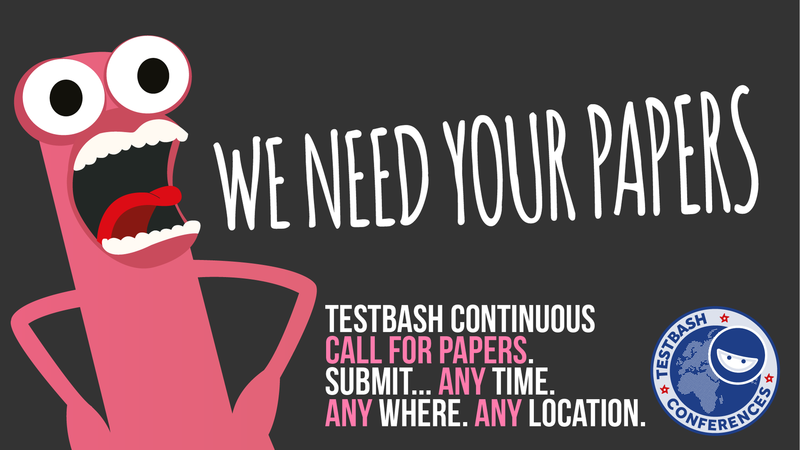 We’ve had so many new speakers come through our TestBash events. To advance our industry we believe need more new people stepping up to share their stories. We believe everyone has at least one story to share. Thanks for listening and we hope to see your submission soon!